Honey mesquite trees (Prosopis glandulosa) are native desert trees. 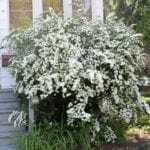 Like most desert trees, they are drought resistant and a picturesque, twisting ornamental for your backyard or garden. If you are thinking of growing honey mesquite, read on for more information. We’ll also give you some tips on how to care honey mesquite in the landscape. 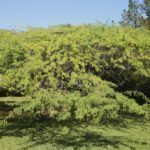 Honey mesquite trees can add summer shade and winter drama to your landscape. With twisted trunks, formidable thorns and yellow spring flowers, honey mesquites are unique and interesting. These trees grow relatively quick to about 30 feet (9 m.) tall and 40 feet (12 m.) wide. The roots delve down even deeper – sometimes to 150 feet (46 m.) – which is what helps to make them so drought resistant. Ornamental features on honey mesquite include pale yellow spring flowers and unusual seed pods. The pods are fairly long and tubular, resembling wax beans. They ripen in late summer. Mesquite bark is rough, scaly and reddish brown. The tree is armed with long thorns, which makes them good candidates for a defensive hedge. When growing honey mesquite trees, you should know that they thrive in U.S. Department of Agriculture plant hardiness zones 7 through 11. These desert plants are highly tolerant of heat and drought once established. This mesquite tree should be planted in full sun but is not picky about soil as long as it is well draining. Honey mesquite care includes regulating the amount of irrigation the plant gets. Remember that this is a desert native. It is an opportunist in terms of water, taking whatever is available. Therefore, it is best to limit water to the plant. If you give it generous amounts of water, it will grow very fast and the wood will be weak. You’ll also need to do foundational pruning as part of honey mesquite care. Be sure to help the tree develop a strong scaffold while it is young.